Summers in Vermont are lovely. Thanks to regular rain, including frequent afternoon thunderstorms, everything is SO GREEN; by early July, Fiona was moaning “I’m sick of green!” Wildflowers abound: Buttercups, Clover, Black-eyed Susan, Coneflowers, Daisies, Bachelor’s Button, and Daylilies. The weather can get hot, up into the 90s, but the most uncomfortable heat tends to be short-lived (and the shady forest keeps temperatures down around our house). Because we’re so far north, the days are looooong: at summer’s height, the sun is up by 6 AM, and doesn’t set until 9 PM. The very worst thing about Vermont summers is the bug situation; you will encounter mosquitoes, flies, no-see-ums, and many other buzzy, biting, irritating species. But that’s a minor inconvenience compared with the glory of the season. 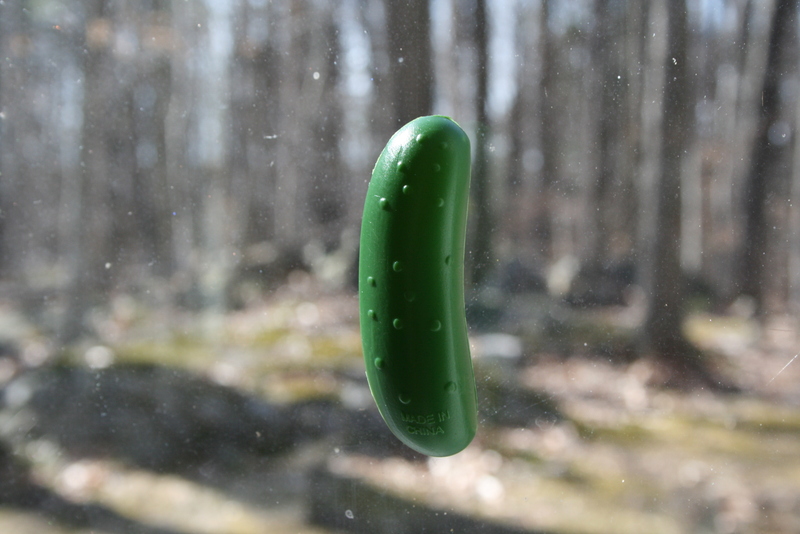 Summers in Vermont are also short-lived. You have three months to pack in the summer fun, because fall comes quickly and you might expect snow by Halloween. 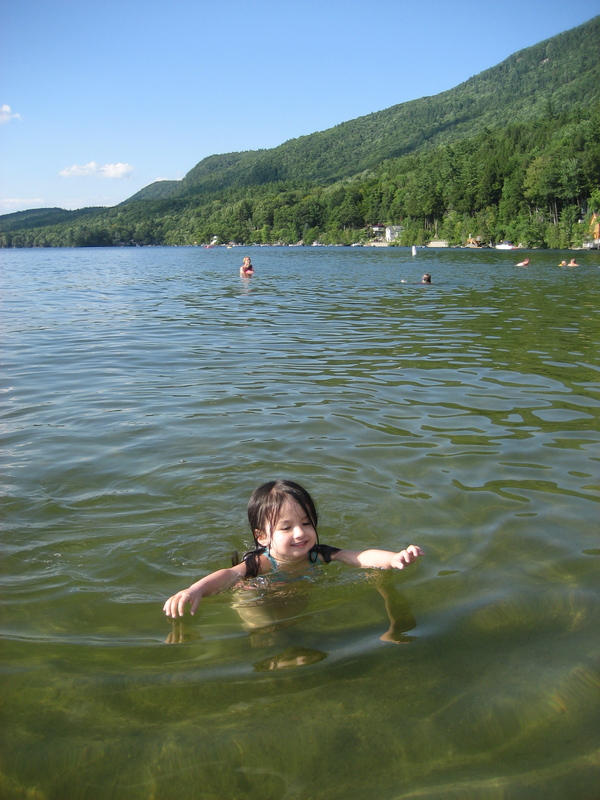 Last summer, a friend observed a kind of summer hysteria that grips Vermonters: Summer’s here! HURRY, HURRY! Let’s do summer!!! Well, with only three months in the year when it’s possible to swim outside, have cookouts, and eat ice cream, you’d hurry, too. ICE CREAM. This is a dairy state, and Vermonters take their ice cream seriously. The first thing to know about Vermont ice cream is that it comes in two varieties: hard ice cream, and soft serve, which Vermonters call “creemees.” Vermont is famously the home of Ben & Jerry’s ice cream, but aside from the generous free samples we received during the Ben & Jerry’s factory tour, we haven’t eaten much of this bran. 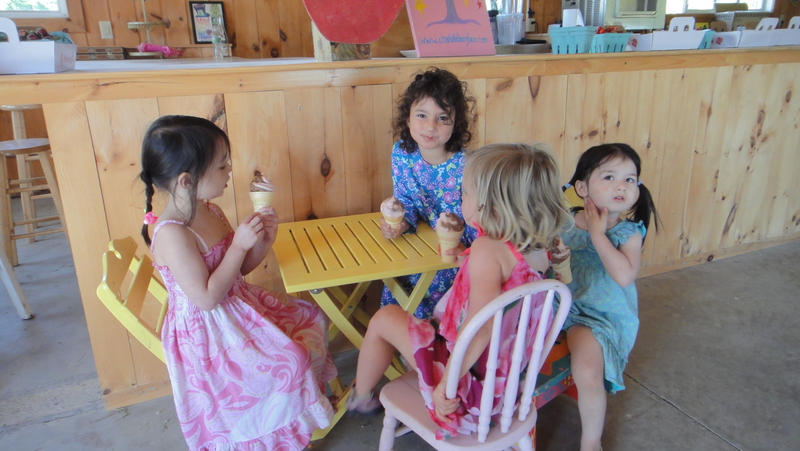 Our favorite places to go for ice cream are Sama’s Cafe when we’re in town, and the Kampersville Deli when we’ve been swimming at Lake Dunmore. Both places serve Hershey’s Ice Cream. 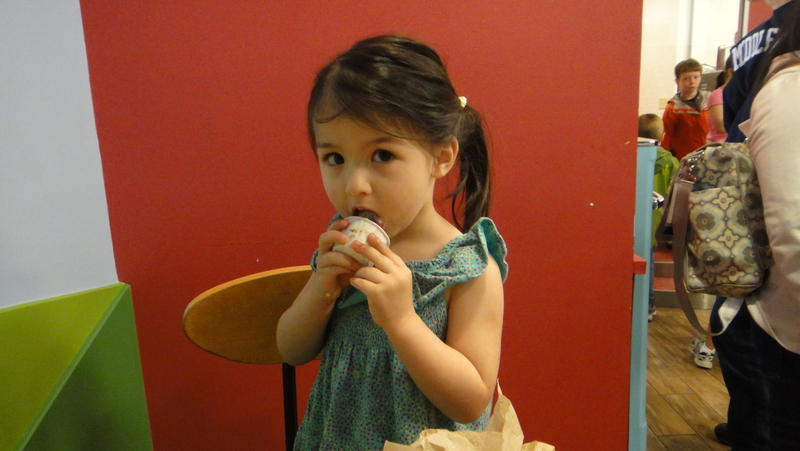 Campbell enjoys a sample at the Ben & Jerry’s factory. A bit further afield, but worth the drive, is The Inside Scoop in Brandon. The Inside Scoop is a old house crammed with antiques and memorabilia for sale, but one of its rooms has been converted into a huge, old-fashioned ice cream counter. They dish out Wilcox’s Ice Cream, which is a family-run business in Manchester Center, VT. The newest contender on the ice cream scene is Lu Lu Ice Cream in Bristol. Lu Lu opened at the beginning of the summer, and would be at home in either of our two previous cities: New York City or Berkeley. They make their own exotic and delicious flavors like “Salted Caramel.” Fiona calls Lu Lu “the fancy ice cream place,” and she’s right. Head for the Water! Our town has a pool, but we’ve never been to it because this area affords so many opportunities to enjoy water in its natural state. 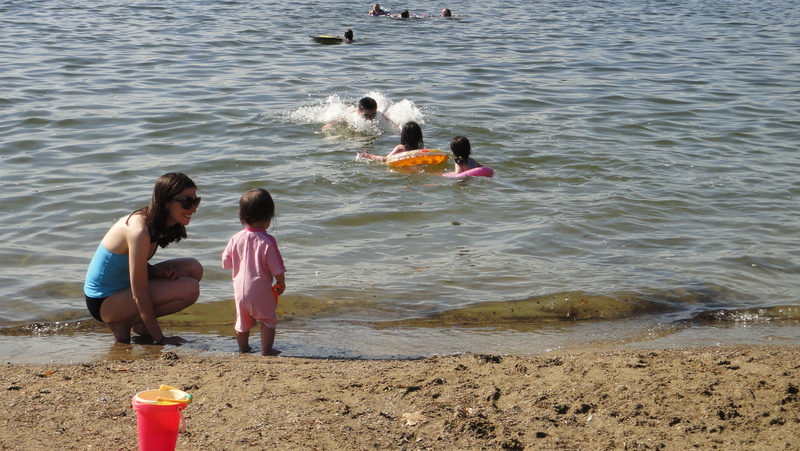 As we did last summer, we’re back in the groove of weekly visits to Branbury State Park, the public beach on the shores of Lake Dunmore. 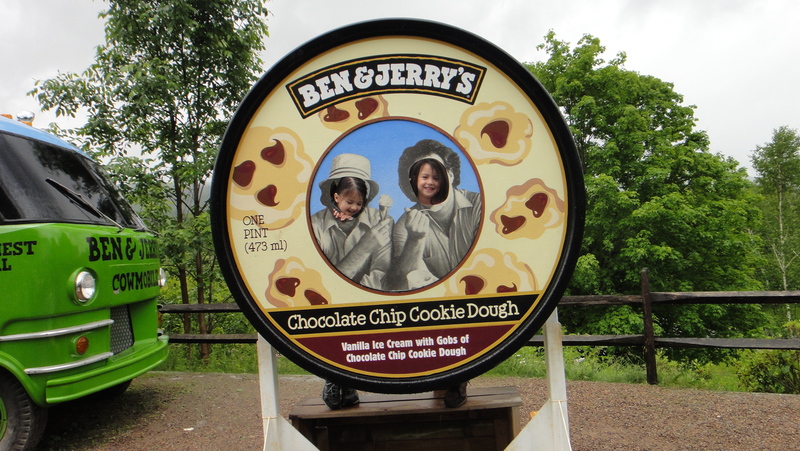 This year, we discovered the fun of taking the ferry across Lake Champlain; if you board in Charlotte, VT, you’ll land in Essex, NY, a charming little town with an ice cream parlor conveniently located a stone’s throw from the ferry dock. 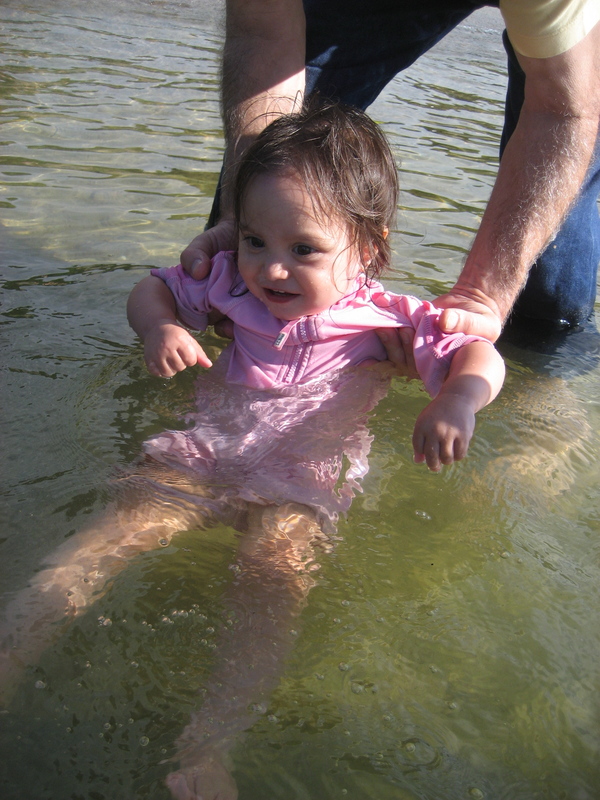 Another new adventure in Summer 2012: swimming in a river, which is slightly more exciting and –in our family, at least — requires adult back-up due to the slippery rocks that line the banks. There are several rivers and swimming holes to choose from around town, but our girls’ favorite is the New Haven River at Dog Team Falls. 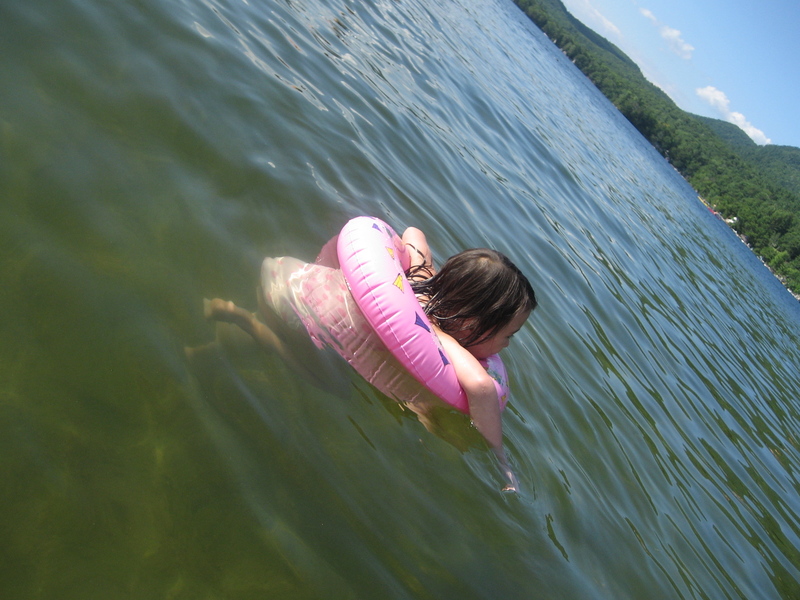 Cooling off in Lake Dunmore. When none of these options are a possibility (in other words, when I’m lacking adult back-up), we stick to the wading pool in our yard. Seek out air conditioning. Because Vermont summers usually have only a few weeks’ worth of really hot weather, most residences here don’t have central air conditioning. Our house is no exception, and although the woods and some strategically-placed ceiling fans usually keep things comfortable, at times we feel the need to head out in search of air conditioning. In our family, this generally means: THE LIBRARY. It’s a rare summer week that we’re not at the library on multiple days — either the main Ilsley Library in town OR the smaller Sarah Partridge branch in East Middlebury. Both libraries are air conditioned, and during the summer they offer much more than just cool air: weekly story and craft times, special performances, “Itsy-Bitsy Yoga,” AND the annual Family Tie Dye extravaganza. Also, the girls end up naked a lot. No pictures of that, though. Happy Dog Days to you and yours! Oooo! Vermont Summers sound so fun! Can I sign up as “additional adult back up” for next summer?! ?